www.vintagefashionlibrary.com: Who says Garanimals aren't chic? "The sign of a great designer is the ingenious way he works with basic shapes. Halston joins two half circles of fabric and adds the couturier touch with a hand finished bias binding around the entire cape. The secret: the proper choice of fabric. 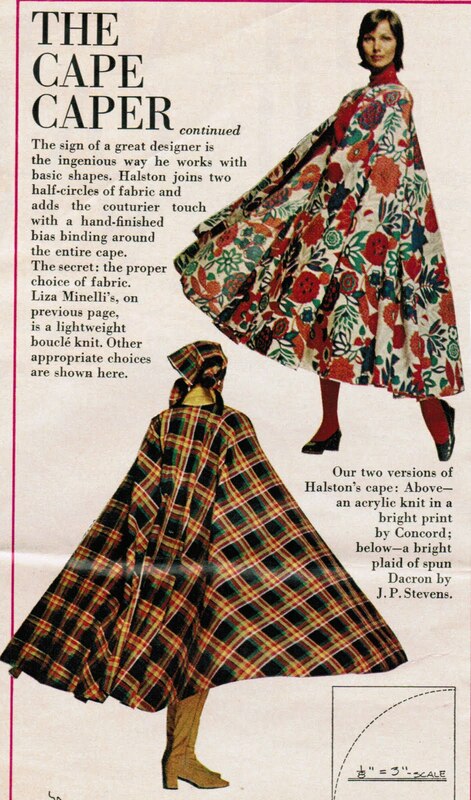 Our two versions of Halston's cape, above, in acrylic knit in a bright print by Concord; below -- a bright plaid of spun Dacron by JP Stevens." This article referred to a photo of Liza Minnelli in Halston's cape that was on the preceding page, but sadly, I don't have that photo. However, let me add a bit of Halston/Liza trivia: Liza was so clueless about dressing in the pre-stylist early 70s that Halston told her to go to Louis Vuitton and buy the luggage of her choice (and that she'd faint at the cost), then to bring it back to him to fill up. He filled the luggage with all kinds of separates, accessories, and everything she'd need for her travels to Paris, New York, and Vegas, because she was jet-setting everywhere at the time. (She had a French boyfriend, and was singing in Vegas regularly.) He even included lists and photos of how to match everything up correctly, so she couldn't possibly go out improperly dressed. She subsequently ended up on the Best Dressed list. So yeah, if you need help, don't dis-count those Garanimal type outfits that tell you what goes with what. It worked for Liza. I just found your site from a link on facebook. You have a beautiful collection of vintage patterns. Thanks for the treasure trove of goodies. p.s. I'm a costume designer, so I take particular note of these comments. Again - Actors!